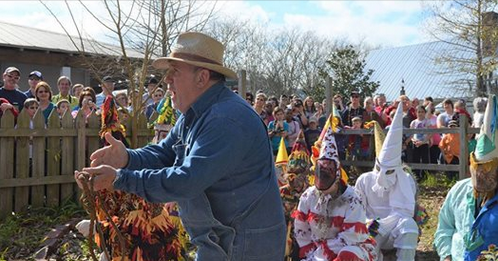 Don’t miss the Basile Mardi Gras Association as they bring a traditional country Mardi Gras run to the city. The run begins at 11:30 a.m. ending with the famous chicken-chase for the children. Following the chase, FeuFollett will kick things off in the Performance Center during our Le Bal du Dimanche à Vermilionville as we return from the Courir. Learn how to make your own king cake in the Cooking School and visit the capuchin-making station. In addition to the Courir, we are adding Mangé: A Community Celebration of Foodways. This celebration is part of our National Endowment for the Arts and Decentralized Arts Funding. This portion of the day will feature area cooks/chefs, artists, writers, poets, folklorists/anthropologists/historians, and musicians joining forces in a community-wide conversation, demonstration and celebration of traditional foodways. These will include cooking demonstrations by regional chefs/cooks, art exhibits by regional artists featuring foodways as prominent elements in their artwork and on functional art (pottery, glass, wooden bowls, gourds, etc.) and foodways inspired poetry and literary readings. But, wait! There is more. This exciting, educational yet intriguing opportunity also consists of a screening of foodways inspired films, discussion/presentations on the role of foodways in our culture and community recorded for the Center for Louisiana Studies archives. What a day! So, don’t miss a moment of this grand celebration! Admission is $5 per person (members $4) and ages 3 & under admitted free. Preparations are still underway for this eventful day throughout our historical village. Stay tuned for a timeline of activities including musical entertainment information.